Paris has a striking new hallmark, as anyone who has visited the city in the past year can attest: thousands of gray bicycles that can be rented for a small fee and dropped off at will at high-tech bike stands around town. The Vélib' self-service scheme has been a roaring success, with more than 30 million rentals since the launch in July 2007. As a result, bicycles have become a mainstream  and very green  form of public transportation in the French capital. "They're highly ecological. They give out no emissions and you propel them with your own energy," notes Jean-Charles Decaux, co-chief executive of JCDecaux, the family-controlled outdoor advertising company that founded Vélib'. 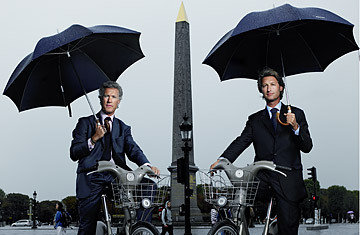 Jean-Charles, 39, and his brother, co-CEO Jean-François, 49, are now building bicycles into a significant business for the company, which was founded by their father and has about $3 billion in annual revenue. By the end of 2008, they'll have installed Vélib'-like schemes in 49 cities, mostly in Europe, and municipal authorities from Chicago to Singapore are flocking to Paris to take a look. Jean-Charles Decaux describes it as "a revolution," but he's careful not to take all the credit. "This was an idea whose time had come," he says. "Today, people are ready to move differently." The scheme took four years to devise and perfect before the company first rolled it out in Vienna in 2003. The brothers developed a sophisticated software system that uses credit-card information and tracks where each bike was rented and returned, how long it was used, and by whom. They also have a business model that works: JCDecaux provides the bikes in return for an exclusive contract to sell outdoor advertising in prime locations around Paris. Some French environmentalists have criticized the business aspect of the arrangement, but without it, taxpayers would have to foot the bill. And while some motorists grumble about the new bike lanes and cyclists who weave in and out of traffic, Parisians are voting with their pedals: more than 200,000 have taken out one-year subscriptions, which cost just $40. In an opinion poll published in May, 94% of Vélib' users said they were satisfied with the service. For all their fine-tuning, there is still one thing that the brothers can't control: the weather. "Cold is not the enemy of the bicycle," Decaux says. "Rain is." Still, getting soaked from time to time is a small price to pay for all the good that Paris' two-wheeled commuters are doing to themselves and the environment.